Superman #4 Review – AiPT! Brian Michael Bendis and Ivan Reis have crafted a really beautiful book here. Superman faces off against the army of Rogol Zaar while Earth’s heroes scramble to get the planet out of the Phantom Zone in Superman #4. Large battles are often hard to capture in comics, but artist Ivan Reis’ layouts here are fantastic, utilizing the two-page spreads to emphasize the size of Zaar’s army and the panels within them to capture the smaller moments. In particular, a vertical panel showing Zaar and his army pursuing Superman back to Earth’s surface really captures the scale of their actions here — an important thing for any Superman story. Inkers Joe Prado and Oclair Albert split the issue, but this allows for a lot of detail throughout the issue, which gives the action a gritty feel. While the action that bookends the issue is exciting, it’s the quieter scene in the middle that gives the issue emotional weight. Readers have seen this moment before — Superman, struck so hard that he goes unconscious, has a flashback to a time that will motivate him in the rest of the fight. But Brian Michael Bendis puts a new twist on this: Superman doesn’t have a flashback to an interaction with his mother or father, but a moment in which he imparts wisdom to his son, Jon. In essence, Superman is being inspired by himself and the lessons he was able to pass down. It’s a small bit of character development that really gives the moment a fresh feeling, even though it’s one that structurally has been done many times before. Color artist Alex Sinclair further helps this moment by using the more vibrant colors in the flashback and opting for muted browns in the panels set in the present. This allows readers to experience the scene with Jon and Clark as if it were the present, which emphasizes the drama of the scene. There are a few places where Superman #4 doesn’t quite land. 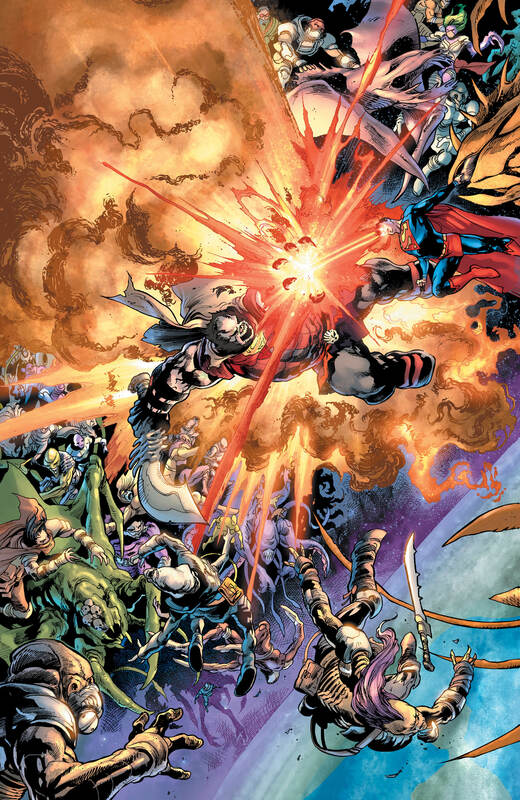 At one point, Superman creates a vortex to launch the horde of enemies back into space, but the panels are too small to capture the grandeur of the moment. There’s an argument to be made that Bendis and Reis are trying to emphasize the drama of Superman’s allies doing the real heavy lifting, eclipsing the raw power Superman is demonstrating. However, the size of the panels leaves the moment feeling a little too understated, given the scale of the battle at the start of the issue. This is ultimately a minor quibble, but one that sticks out in an otherwise stellar issue. Brian Michael Bendis and Ivan Reis have crafted a really beautiful book in Superman #4. While there are smaller moments that don’t work, it’s only because the rest of the book is so strong. Inkers Joe Prado and Oclair Albert, Alex Sinclair, and letterer Josh Reed make the issue come alive, so much so that one can forgive the fact that the audience still doesn’t know much about Rogol Zaar’s zealotry. Fantastic action and a strong emotional anchor elevate Superman #4. The story beats aren't completely new, but Brian Michael Bendis and Ivan Reis add wrinkles that make the issue feel fresh and exciting. The interaction between Clark and Jon feels real and gives Superman some small development that goes a long way. Ivan Reis' artwork is gorgeous, made even stronger by Joe Prado and Oclair Albert, who give the issue the detail it needs. Alex Sinclair's color choices are a subtle but important part of the storytelling. Some small moments don't get the page space they need, but that's a very minor problem.